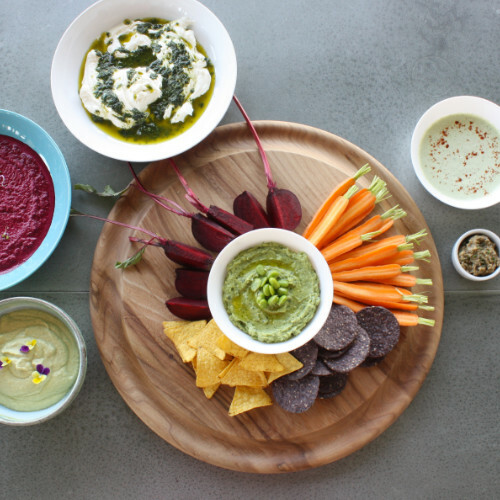 A lovely vibrant green avocado and broad bean dip, great for a summer lunch or picnic. This is a great alternative to the usual guacamole, incorporating some delicious seasonal, fresh broad beans and mint. As well as being delicious and a staple part of many a diet avocados are a highly nutrient dense fruit. They are packed full of healthy fats which promote brain health are good for the skin and can actually help you loose weight. They also contain folic acid to boost the immune system and help prevent summer colds and mood boosting vitamin D. This is a great way of incorporating them into a meal be it as a replacement of guacamole or hummus in a wrap, as a dip for veg sticks or tortillas, or simply spread thickly on a slice of bread you’ll be doing your body and your taste buds a favour. Bring a saucepan of water to the boil, add the broad beans and blanch for two minutes, then drain, and plunge into cold water. This stops the beans from cooking but also ensures they keep their lovely bright green colour. Peel off the skins, and put the beans in a food processor. This might seem fiddly but its definitely worth it for the taste and the consistency of the dip. Add the avocado, lemon juice, olive oil, and mint, and blitz until almost smooth.